Paragliding and what is it? Paragliding is a recreational sport involving lightweight, free-flying, foot-launched (ie running off the end of a cliff or mountainside) glider aircraft. The pilot sits in a harness below the wings and flies like a bird, soaring high with the thermals (rising warm air) before eventually coming to land on terra firma. 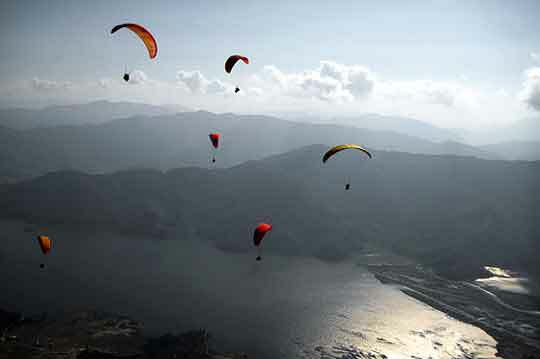 Paraglider flights can last many hours and cover many hundreds of kms, though flights of 1–2 hours and covering some tens of kms are more the norm. Paragliders are unique among soaring aircraft in being easily portable. The complete equipment packs into a rucksack and can be carried easily on the pilot’s back, in a car, by porter or on public transport. In comparison with other air sports this substantially simplifies travel to a suitable take-off spot, the selection of a landing place and return travel. 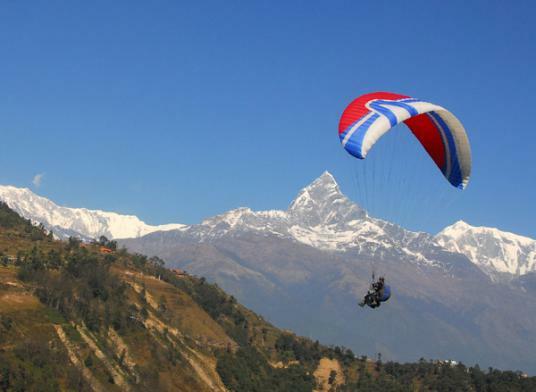 Nepal has near perfect conditions for paragliding and this is where many of the world’s top pilots hang out. 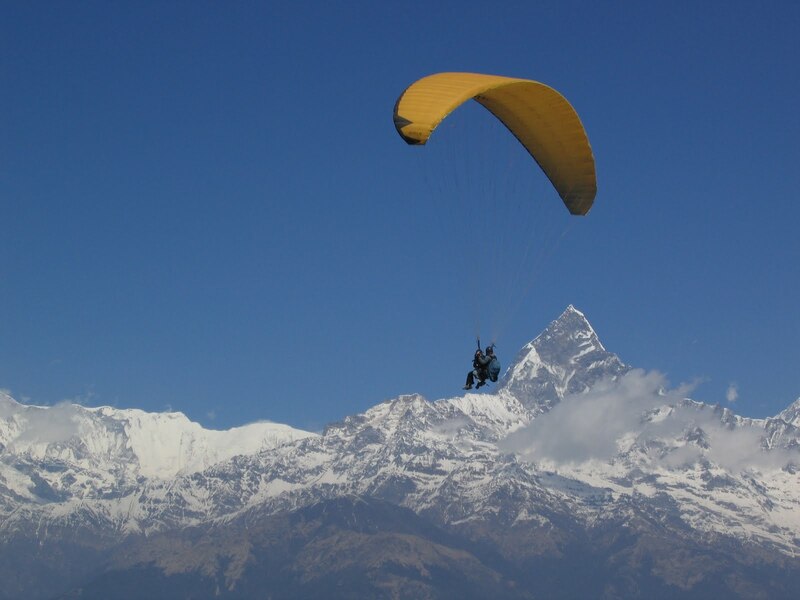 The main paragliding companies are all based in Pokhara and we can offer you tandem flights with an experienced pilot as part of your ‘Nepal Experience’. This is especially true if your trip takes you through the tourist city of Pokhara. If you are serious about learning how to paraglide then we can book you on a course. If you are experienced as a pilot and want to do a paragliding trek or just want to test the thermals we can let you know what courses are available and when. 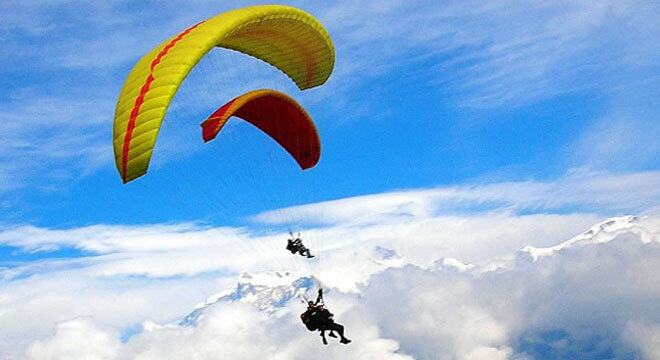 The season to paraglide is from late September to late May, though early October to early March are the recommended times. Price Tandem flights (30 minutes for beginners) cost US$ 110 to US$ 125. Price includes Airport pick-ups/drop-offs. All paragliding costs. Price excludes Accommodation and food in Kathmandu and Pokhara, transport between Kathmandu and Pokhara, alcoholic beverages, tips, your insurance and personal expenses.